Maui County is contracting w/ Anaergia Services, LLC via its local Maui company MANA, LLC (Maui All Natural Alternatives) to build a waste digester power plant. Create biogas to power the Wailuku-Kahului Reclamation Facility (WKWWRF) next to it. THEN: Anaergia will use the heat from the digester to dry all of Maui’s human sludge (excrement) and make it into fertilizer pellets to sell back to Maui residents. And the plant will be located in the tsunami evacuation zone. 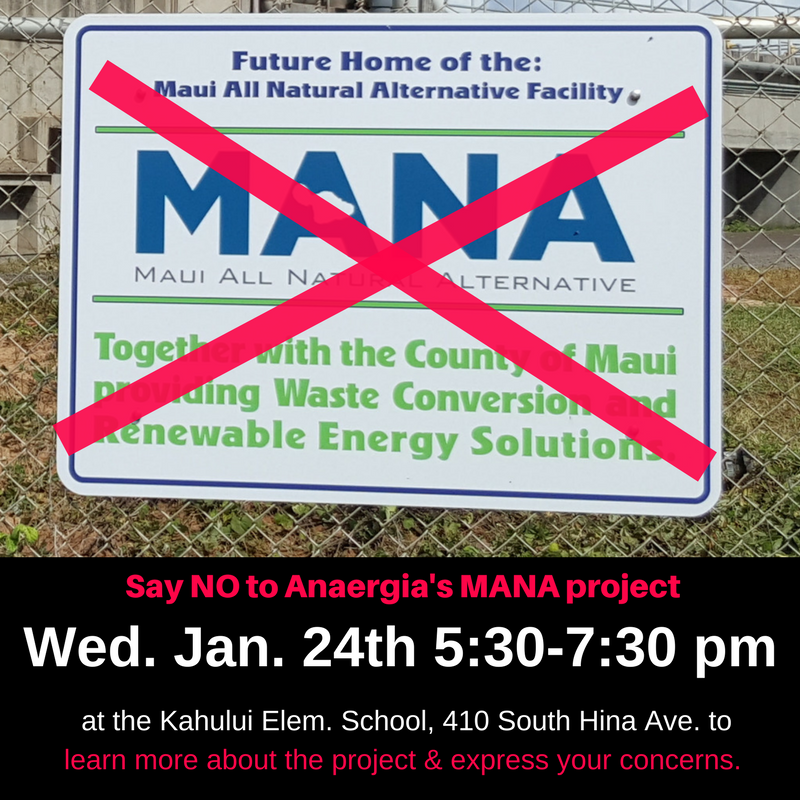 Sierra Club Maui submitted comments on this project, back in late 2016 when the County Council’s Infrastructure and Environmental Management Committee (IEM) was considering a resolution authorizing a lease to Anaergia for this facility. Then, very quickly, the lease resolution was pinched out of the IEM Committee by Council member Don Couch and Chair Mike White, and brought before the full Council in the last meeting of 2016, where the lease was approved without further discussion. In January 2017, some new council members were sworn into office who likely would have put up a fight against rubber stamping this lease – so the actions in December 2016 ensured the new council members couldn’t stop the project. Flash forward to January 2018. 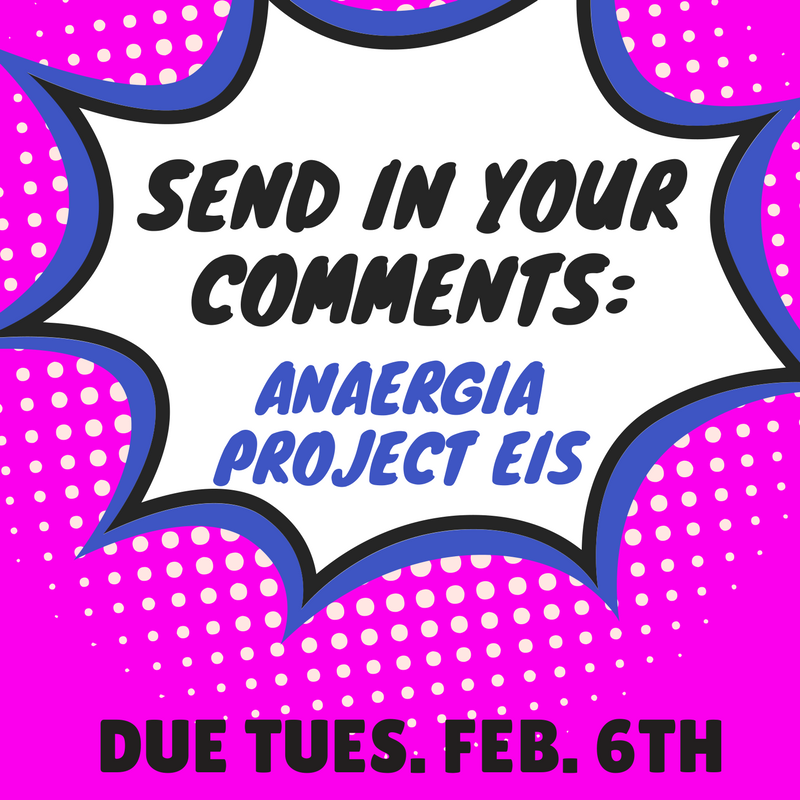 Anaergia/MANA has submitted a Draft Environmental Impact Statement (DEIS) to the county, which must be approved before the project can move forward, and they are holding a public meeting on Wednesday, January 24th for the public to learn about the project. We urge Sierra Club Maui members and supporters to attend this meeting and to voice concern with this project. At first glance, the project might look eco-conscious and economically viable – but when you delve into the details, it becomes very clear this project is, in a nut shell, going to lead to a lot of money spent for little-to-probably no improvement, while getting in the way of real improvement in the county’s usage of renewable energy and fiscal responsibility. ***The cost of electrical generation for the cancelled solar PV project with Haleakala Solar at WKWWTF would have provided energy at about half the cost of Anaergia’s project. The solar PV project was cancelled by former Dept. of Environmental Management Director Kyle Ginoza after Haleakala Solar had already done $75,000 in design work. At that time, solar energy would have cost about 15.9 cents/kwh for the first year, compared with Anaergia’s 29 cents/kwh. And since then, MECO’s latest Purchase Power Agreement for solar has dropped to 11.7 cents/kwh (with cost of storage factored in, the final price would be higher, but it would still cost much less than 29 cents/kwh). Cost: Initially, Maui County would pay for electricity at a rate close to that of today’s oil-based electricity from MECO, but with a contracted rate increase of 2.2% per year for twenty years. Without a doubt, within five or ten years the county will be kicking itself for committing to such an exorbitant price for electricity as the cost of renewable energy continues to fall (and solar is already well below even the starting price). At face value, the proposal may sound economical because Anaergia and its subsidiary assume the cost of building the power plant. However, there is no reason to consider Anaergia to be a charitable organization. 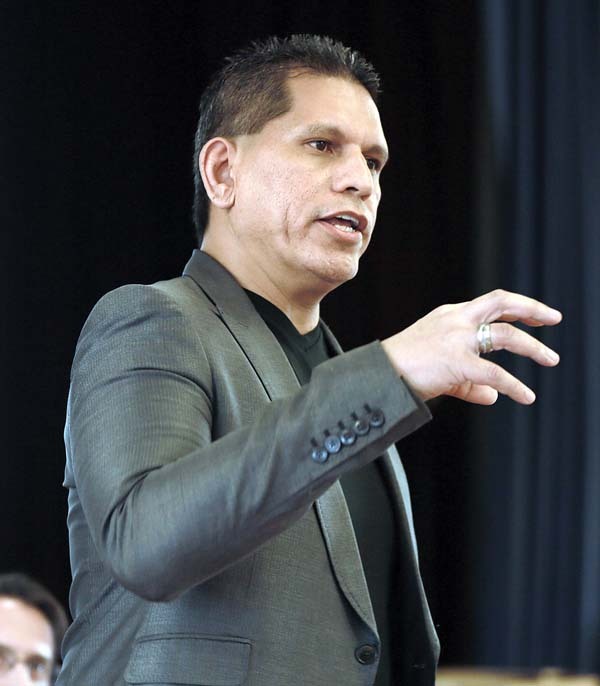 Its calculation of the charges to Maui County are based on recouping the $20M construction costs, costs for permitting, costs for running the plant for 20 years (including energy crops), and profits. Rather than a great deal, this can be considered a loan at very high interest to the county. If the project made sense for other reasons, it would be more cost-efficient to issue a bond or seek grants and finance it without contracting Anaergia. Location: There was agreement at a 2016 hearing, including by Director Stewart Stant, that the location which would host the power plant, being at sea level and in a tsunami zone, is a poor choice. The county has been thinking about moving the WKWRF inland. Director Stant said it is more urgent to move the Wailuku Pumping Station, which supplies waste to WKWRF (Wailuku Kahului Wastewater Reclamation Facility), than to move WKWRF itself. However, one does not exclude the other. Adding a power plant to the existing WKWRF means, 1) it will be much more difficult to move WKWRF, and 2) it canʻt be moved until 20 years after the power plant is online (which itself is likely years away). Alternatives: Director Stant said that the reason for proposing the electricity generating plant for the WKWRF instead of the Kihei Wastewater Reclamation Facility is that the Kihei facility already has an excess of solar power during the day but has no way to store the power for use in the evening and at night. A much more cost-efficient investment would be to add battery storage to the Kihei facility. Combining solar and storage at Kihei could be a pilot project which could then be replicated at the other facilities. Community input: County’s Corporation Counsel said there is no room for public input during contract negotiation for services (which she said is 95% done). However, collecting public information and input only after a contract is finalized is an expensive and cumbersome model which generally leads to community dissatisfaction. Conflict of Interest: Currently, the county is both the proposing agency and the accepting agency, which is a clear conflict of interest. Because the project will be built on state-owned land, we ask that a state agency be the accepting agency. This will resolve this conflict of interest. Third Party Consultation: We are concerned that this project’s FEIS has not been outsourced to a non-partial third party consultant. If MANA researches and writes its own FEIS, it is very unlikely that potentially serious concerns will be highlighted and examined and that feasible alternatives will be given fair consideration. Local knowledge: We are concerned that because no local expert consultants have been hired to assess all potential environmental and cultural impacts (especially on the local bird populations in the Kanahā Wildlife Sanctuary) that the FEIS will be severely lacking in important local expertise. We would like to see local avian experts brought on board to analyze this project. Tsunami Zone: We are very worried about not only placing more expensive long-term infrastructure in the tsunami zone but also the effects it may have on the environment if a tsunami or extreme flooding event happens. If a catastrophe occurs, how will MANA mitigate the risk of waste, flammable gas, and other toxic emissions escaping from the facility into the surrounding industrial and residential areas? MECO: How will the county negotiate with MECO to take the WKWWRF off its grid? What might be the exit costs of taking the facility off the grid? Energy Analysis: For the “Identification of Alternatives,” we would like independent energy and waste consultants who have no connection to MANA to create a more robust list of potential alternatives and analysis of their pros and cons. Carbon and methane footprint: While the facility will create energy from renewable resources, we have doubts as to whether it will actually reduce our carbon and methane footprint. We would like the FEIS to contain a complete analysis of the full carbon and methane footprint of the facility, as well as a listing of any VOC emissions that may occur. patents covering the key innovations inherent in our technology. feedstuffs and return a wide range of useful byproducts. greenhouse gases, and no emission of toxic materials into the environment. aged explosives can also be processed if required but with appropriate handling. or light fuel oil (typically for maritime use). the chemistry being executed within the equipment. energy via a closed-cycle gas turbine (CCGT). emission status of the system is maintained. reducing demand on local electricity or other energy supply systems. If required, desalination facilities can be supported by our systems. semisolids – without loss of efficiency related to other outputs. dependent on the nature and/or mix of feedstuffs used. road construction, horticultural deployment or equivalent use. Biodiesel refining operations to move to Big Island. 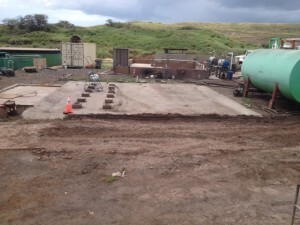 America’s oldest biodiesel production plant has vacated the Central Maui Landfill. While continuing operations in the collection of used cooking oil and trap grease waste, Pacific Biodiesel has closed its prototype facility. 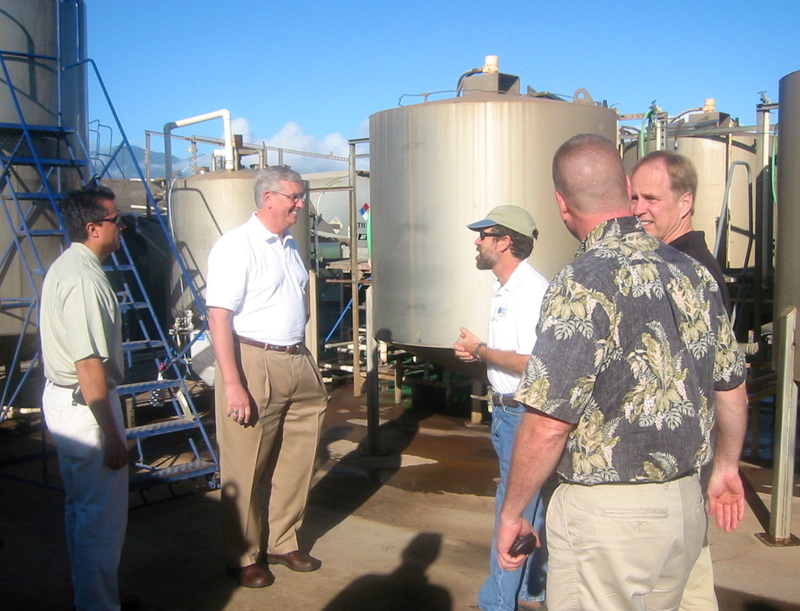 Built in 1996, Pacific Biodiesel’s Maui plant has been widely recognized as a pioneer in America’s biodiesel industry and was the longest continually operating commercial biodiesel processing facility in the nation. The Maui operation has won awards from the Solid Waste Association of North American, the National Recycling Coalition and the United Nations Industrial Development Organization. Pacific Biodiesel will continue its full range of pumping and collection services on Maui and Lanai as well as all its collection and processing operations on Oahu and Hawaii Island. Distribution of the Company’s biodiesel fuel will continue Statewide. Prior to closing, the Puunene facility was providing pre-­?processing of waste oils for shipping to its state-of-the-art biodiesel refinery in Hilo. Now that the landfill facility has closed, the cooking oil collected on Maui will be transferred directly to Big Island Biodiesel. Grease trap waste will continue to be processed on Oahu and Hawaii Island. In the meantime, Pacific Biodiesel will continue to collect Maui County’s waste oils and grease and distribute premium distilled biodiesel across the state. To date, the Maui-­?based company has diverted over 22 million gallons of waste from the community’s landfill, greatly reduced the frequency of wastewater spills due to clogging by grease, and saved the county’s restaurants a lot of money. Retired Pacific Biodiesel Operations Manager Larry Zolezzi estimates the savings to Maui restaurants to be about $1 million, explaining, “The pumpers used to charge $1 per gallon to pick up and dispose of used cooking oil (uco) and $2 per gallon for grease. As the first biodiesel company in the U.S., we changed the culture about what to do with uco and now grease.” Since 2010 Pacific Biodiesel Logistics has been collecting uco for free and offering restaurants reduced rates for grease trap service. On March 24, 2014 three Maui Sierra Club directors met with Anaergia, the company who was awarded the contract for integrated waste conversion (to gas/energy pellets/recyclables/etc) at the Maui landfill. This is a report on what was Anaergia told us. Maui Sierra Club is still gathering information and running numbers so there my be more information forthcoming after we speak with the existing recyclers and see how this contract will impact them and how their future plans impact the numbers. There are already indications that the numbers discussed below don’t consider the diversion of greenwaste and fats, oils and grease and that we might be paying tipping shortfall penalties on this contract. More to come as we research and do number crunching. Karen started out by saying that the Sierra Club’s policy on trash is first to reduce (by reducing packaging, discouraging disposable items etc), then reuse and next (3rd down the line) recycle. She also pointed out that the Sierra Club policy is that energy pellets from trash should be burned with the same pollution controls as would be required by the trash contained in them and that we are morally responsible for the pollution ensuing if they are not. Criticism of the contract not having the details nailed down can be explained by the County issuing an RFP that combined what Karen said were normally two phases: A contract to write the parameters and details, followed by a contract to fulfill the requirements identified in the first phase. Anaergia indicated that the county simply asked for a bid on (Karen’s words) dealing with the trash in return for tipping fees, leaving the details to be worked out by Anaergia. This explains why the plan has changed during the trash forums and why the plan is still changing. Anaergia is adapting the plan based on community feedback (such as need for compost). Anaergia says that the plant basics (materials separation, digester and energy pellets) remain the same. Karl pointed out that the 125k minimum is substantially below the current 185k of trash being produced so that there would have to be a massive reduction in trash for this to even be an issue. 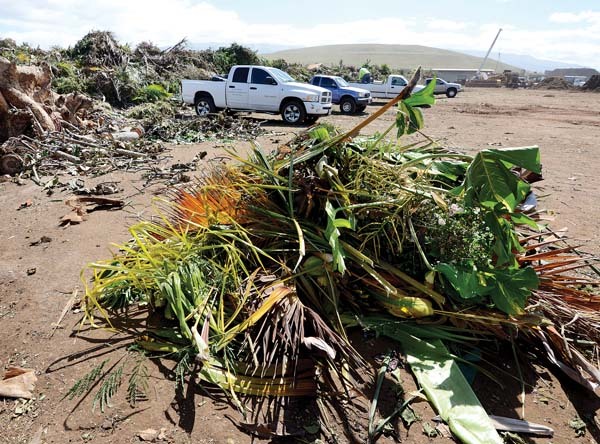 Thus there is less pressure for Maui to take trash from outside the county, one hopes. Karl said, though that they will most likely design the plant to accommodate 200k tons/yr or more so they can meet future increases. Anaergia would build a facility next to the landfill on land they purchase. Trash trucks would enter the materials separation facility. Anaergia would separate out the recyclables. Metal via magnets, plastics via floating, hand sorting or optical separation, paper and cardboard most likely by hand sorting. The blue bag source separation idea is not dead but didn’t seem to be in contention. Greenwaste woiuld go to the composting operation – most likely EkoCompost, if they arrive at an agreement. Other recyclables would go to our existing recycling companies or be shipped. Currently the county pays recycling companies like Aloha tipping fees but it was unclear what effect this new plan would have on them. Karen asked Anaergia to make a point of knowing whether the sludge they have to process is contaminated with landfill leachate since this could introduce toxics that make it unsuitable for compost. There was also discussion that organic farmers cannot use compost that is made from sewage sludge. Other noninert materials including the sludge after digestion would be dewatered (and the water used in the floating separation) and formed into energy pellets. Karen pointed out that it is unrealistic to think that HC&S will take the pellets in lieu of coal since they are already being investigated for their emissions violations and it is extremely unlikely that parent company A&B which is primarily a developer would invest the funds needed to upgrade the emissions controls. Lucienne pointed out the Sierra Club is trying to move “Beyond Coal” not “replace coal”. Medical, hazardous and construction waste is not accepted by the County landfill. Tires are not currently taken but Karl talked about a recycling process for any tires found in the waste stream. Karen suggested that the Sierra Club work to get a program to encourage local businesses to process recyclables like shredded tires for playground materials, plastic lumber (like Aloha used to make) and glassphalt (as used to be made here) and that this would be advantageous to all. Once Anaergia has recycled, created natural gas, created pellets and compost, the remainder which is estimated to be about 20% of the waste stream is sent to the landfill and Anaergia pays tipping fee to the County. Thus most likely the Landfill will last 5 times as long because it will be taking in 1/5 the waste. Lucienne asked if we could have a system like Santa Cruz where reusable materials (concrete blocks, old bicycles, furniture etc) are separated out for people to take. Currently this is prohibited at the County landfill. Karl was understandably cautious but Karen pointed out that Anaergia could contract with an entity like Big Brothers Big Sisters to come and haul away these items for sale. Sam made a note to look into this. Karl and Sam clarified that the state revenue bonds are different from the Superferry bonds in that they are sold by the company and guaranteed by the company’s revenue without the State or County being on the hook to make up any default. It is still an open question what the amount of the bonds will be. The bill before the legislature has $50,000,000 as the number. Karl said that they would probably sell the natural gas to Hawaii gas company to transport, pipe or whatever. They couldn’t quantify how much energy pellets they’d produce as it depends on how much they can recycle and compost. Dr. Andrew Bennek (PhD Chem E) is head of the company. Previously created Zenon that developed the sewage filtering process in use around the world and sold business to GE so Anaergia is privately held company. People who hauled their trash to the landfill themselves would probably dump into county containers which would then go to Anaergia and be counted in the tipping fees the County pays them. Anaergia said that top guys would most likely be initially from the mainland but that they intend to hire mostly local and train and promote local. The contract runs 20 years. All the materials (recyclables, gas, pellets) are the responsibility of Anaergia to find takers/buyers for. They suggested the Oahu coal plant might take energy pellets and that if not, that shipping to Asia or the Mainland is cheap because their ships deliver here and go back empty so the carbon footprint is lower than one would think and the rates are lower too. Karl also made the point (when Karen expressed concern about energy pellet emissions) that replacing coal even with something that wasn’t 100% without emissions (Karen’s categorization) would stop the mountaintop removal and other problems associated with coal. $100 FOG -County collected. But reality here is that is PBT collects the overwhelming majority of FOG through the use of private haulers. Also to note: the rate for processing recyclables is $100 per ton; however, it falls to $68 after 2250 tons/ in a given year. In this case, recyclables are defined as those coming from drop boxes or curbside pickup. Now going the other direction, so to speak, after processing, Anaergia estimates that approximately 15% to 20% of the material will be returned to Central Landfill. This will be mostly consist of inert materials such as rocks, sand dirt, grit etc. Note that there is no incentive for Anaergia to landfill any of the other materials listed above because they would be charged the same fee as MRRF receives from the County. For your second question, in terms of what may or may not be diverted before it gets to MRRF (thus impacting the conservative figure of 185K tons per year figure), it’s really hard to speculate what a private company may or may not do. But if past history is a good predictor of future behavior, then the Waste Characterization study would indicate that it’s highly unlikely there will be any major reduction to a level near or below the 125K tons per year guaranteed minimum quantity in the contract. Also, the Waste Characterization Study forecasts an amount of 148,479 tons of MSW for 2012 (compared to 149,900 of actual MSW in FY 2011). This combined with green waste, sewage sludge and County-collected FOG is once again well above the 125,000 threshold. So, for example, even if 100% of the Green Waste or and County collected FOG got diverted, the total is still well above the 125,000 threshold. Finally, there doesn’t seem to be a breakout number for cardboard brought to landfill by private haulers–at least none that I could get a hold of in the County provided materials.